Oracle is a secured database that is broadly used in Indian & multinational companies. Although, the demand for Oracle developer is increasing and SQL-expertise is highly considered in the market. If you are looking for Oracle Interview Questions, this is the right place for you. We gathered some Oracle Interview Questions and answers for Freshers & Experienced candidates that will help you to crack the interview & get a dream career as Oracle Developer. Here are the list of important Oracle Interview Questions and Answers for freshers and experienced candidates. Besides, every question includes their answer. It’s a great practice to discern all of these Oracle DBA questions before attending the interview. 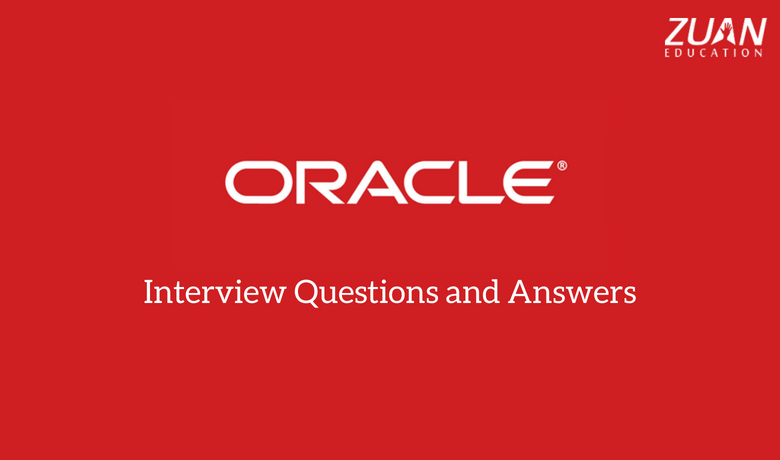 Let’s have a look at this important Oracle interview questions and answers. Oracle is a company and also it is a database server. It controls data in a very structured way. It also enables the users to store and retrieve related data in a multi-user environment so that multiple users can simultaneously access the same data. All this is achieved while delivering high performance. PL/SQL is a procedural language extension over SQL implemented by Oracle. It expedites declaration of functions, variables, and conditional operators in SQL syntax by providing the developer more freedom and comfort design with intricate queries. 3. Which language is used to develop Oracle? Oracle has been developed using C Language. 4. Explain the components of the physical database structure of Oracle database? One or more data files. Two or more redo log files. One or more control files. 5. Explain what is RAW datatype? A RAW data type is utilized in storing values in binary data format. And the highest size of a RAW in a table is 32767 bytes. 6. Explain what are the roles of DBA? DBA has the potential to generate new users, remove existing users or change any of the environment variables or rights assigned to other users. 7. Do you know what is a tablespace? A database contains Logical Storage Unit called tablespaces. A tablespace is a collection of relevant logical structures. In fact, a tablespace group associated logical structures together. 8. Explain about Dual Table? The dual table is controlled by the user SYS and it can be obtained by every user. It also includes one column null and one row with the value X. Besides, the Dual Table is beneficial when you need to return a value just once. The value can be a consistent, pseudocolumn either expression that is not determined from a table with user data. 9. Do you know what are Schema Objects? The schema objects are tables, indexes, sequences, views, databases triggers, packages, procedures, synonyms, and functions. 10. Explain what is BLOB? A BLOB is a data type which is a binary string with a differing length. It is utilized in storing two gigabytes of memory. The length needs to be declared in Bytes for a BLOB. 11. Explain what is meant by recursive hints in Oracle? The number of times a dictionary table is repeatedly called by multiple processes is known as a recursive hint. Although, it happens because of the small size of data dictionary cache. 12. Explain about Oracle index? An Oracle index is an optional structure connected with a table to have a direct way to rows. And that can be built to enhance the execution of data retrieval. Besides, an index can be built on one or more columns of a table. 13. Do you know what is DML? DMA refers to Data Manipulation Language which is utilized to access and manipulate data in the existing objects. The DML statements are inserted, select, update and delete and it won’t inherently commit the current transaction. 14. Explain the components of the logical database structure in Oracle database? The components of the logical database structure. 15. What is MERGE statement in Oracle? MERGE is a deterministic statement. It also helps to insert or update rows in one table. It is also beneficial in data warehousing applications. This statement is a comfortable way to combine various operations. 16. Do you know what is Raise_application_error? Raise_application_error is a procedure of package DBMS_STANDARD. It enables user_defined error or error code and error messages from saved subprogram or database trigger. 17. Explain the use of NVL function? The NVL function is utilized for restoring NULL values with provided or different value. For example- NVL(Value, replace value). 18. Explain what is a trace file and how is it built in Oracle? Trace files are the files utilized to store details of exceptions delivered by Oracle background processes i.e. dbwr, lgwr, pmon, smon etc. They are usually built for diagnostic dumps as well and assist in debugging and solving exceptions in Oracle. 19. Explain what is the difference between DELETE and TRUNCATE? DELETE is a DML command. TRUNCATE is a DDL command. TRUNCATE re-set the memory blocks after the performance and much active than DELETE in most of the cases. 20. Explain about Semijoin? and How to implement it in SQL? A semi-join is an operation where the EXISTS clause is utilized with a subquery. It is called a semi-join because even if duplicate rows are returned in the subquery, the only one set of matching values in the outer query is returned. Moreover, it can be implemented utilizing WHERE EXISTS clause. 21. Explain the benefits of ORDBMS? The language of the DBMS can be combined with an object-oriented programming language. The language may even be precisely the same as that utilized in the application, which does not confine the programmer to have two representations of his objects. 22. Explain what is NULL value in Oracle? The NULL value represents missing or unknown data. It is utilized as a placeholder or represented it in as default entry to show that there is no actual data present. 23. Do you know how many memory layers are in the Oracle shared pool? 24. Explain the difference between Entity, Attribute, and Tuple? Entity – A important thing about which data is needed. For example: EMPLOYEE (table). Attribute – Something that defines the object. For example: empname, empno, empaddress. Tuple: A row in a similarity is called Tuple. 25. What is a cursor? Why is cursor needed? A cursor is a defined private SQL area from where the data can be passed and executed or accessed. The cursors are needed to process rows separately for queries returning numerous rows. An alert is a window which seems in the center of the screen and covers a part of the current play. 27. What is meant by recursive hints in Oracle? And why it happens? The amount of times a dictionary table is frequently called by multiple processes is known as a recursive hint. Although, it happens because of the small size of data dictionary cache. 28. Do you know what is PRAGMA? PRAGMA is Oracle keyword to inform the compiler to do some special work. 29. Explain what is the operation of HAVING clause? The HAVING clause restricts the aggregated queries. After doing aggregation utilizing the GROUP BY clause, we can utilize the HAVING clause to append new conditions to the result. 30. What are different Oracle database objects? 31. Explain what is WITH CHECK OPTION? The WITH CHECK option clause defines check level to be done in DML statements. It is utilized to prevent changes to a view that would produce results that are not involved in the subquery. 32. Explain the different types of modules in Oracle Forms? 33. Explain the difference between DATA DICTIONARY and USER TABLES? DATA DICTIONARY: It is a collection of tables built and managed by the Oracle Server. It includes database information. Besides, all the data dictionary tables are controlled by the SYS user. USER TABLES: It is a collection of tables built and managed by the user. It also includes USER information. 34. What is the difference between DATE and TIMESTAMP in Oracle? The date is utilized to store date and time values including month, day, year, century, hours, minutes and seconds. The TimeStamp datatype stores everything that that Date stores and additionally stores fractional seconds. 35. Explain about hash cluster? Hash Cluster is a technique utilized for storing the table to perform it actively to retrieve. In order to recover the rows from the table, implement the hash value on the table. 36. Do you know what is the difference between pre-select and pre-query? This fires throughout the performance and count query processing after an oracle form generate the select statement to be performed, but before it’s execution. Also, this fires before an oracle form issue the select statement. It performs before the pre-select trigger. 37. How to convert a date to Julian Date format? 38. Explain about database trigger? and How to create it? A database trigger is a procedural code that is automatically executed in response to particular events on a specific table or view in a database. The stored PL/SQL block is related to a table, a schema or a database. Moreover, A trigger can be built utilizing the CREATE TRIGGER clause. I can decide to enable or disable it utilizing the ENABLE, DISABLE clauses of the ALTER TRIGGER or ALTER TABLE statement. 39. What is a cross join? The cross join is defined as the Cartesian product of records from the tables present in the join. It will produce a result which connects each row from the first table with every row from the second table. 40. Explain which types of joins are utilized in writing SUBQUERIES? 41. What is the major difference between CHAR and VARCHAR2? CHAR pads blank spaces to a maximum length, at the same time VARCHAR2 does not pad empty spaces. 42. Explain what is a transaction? A transaction is a collection of SQL statements between any two COMMIT and ROLLBACK statements. 43. What is the active query method to fetch data from the table? You can apply ROWID to fetch Row from the table. The use of ROW ID is the fastest query method for fetching data from the table. 44. What is the use of the CONSISTENT option in EXP command? It also specifies the read-only statement for export to guarantee data consistency. 45. What is a query to display a list of tables owned by the user? 46. Explain the difference between SUBSTR and INSTR? SUBSTR returns particular portion of a string. INSTR gives character position in which a pattern is discovered in a string. SUBSTR returns string whereas INSTR returns numeric. 47. Explain the usage of the control file in Oracle? The control file is utilized for database recovery. It is also utilized to find the database and redo log files that should be prepared for database operation to go ahead, whenever an occurrence of an Oracle database starts. 48. Do you know what is a Candidate Key? The columns in a table that can serve as a Primary Key are called Candidate Key. 49. Do you know what is a package cursor? A cursor declared in the package term without an SQL statement. It can be accessed by other procedures in a package. The SQL statement for the cursor is added at runtime from calling procedures. The body represents the queries for the cursors and the code for the subprograms. 50. What is a query to display a list of tables owned by the user? Hence, these are the important and useful Oracle interview questions. We hope this list of Oracle interview questions and answers would be helpful for you to clear the interview. If you have any doubts about this SQL interview questions, let us know in the comments. I have my interview for oracle dba and for that I need to prepare well hence I was looking for the top oracle interview questions. Here you have listed top interview question which I think best way to prepare for. I found your web site via Google whilst searching for a similar subject, your website came up, it looks good. Hi. I have checked your zuaneducation.com and I see you’ve got some good content.